THIS COMPETITION IS NOW CLOSED, THANK YOU FOR ALL YOUR ENTRIES! Renowned as one of the most famous, hardest and longest horse races in the world, the Grand National is a fantastic day out! We’re extra excited about this year’s event because we have two FREE pairs of tickets to give away! 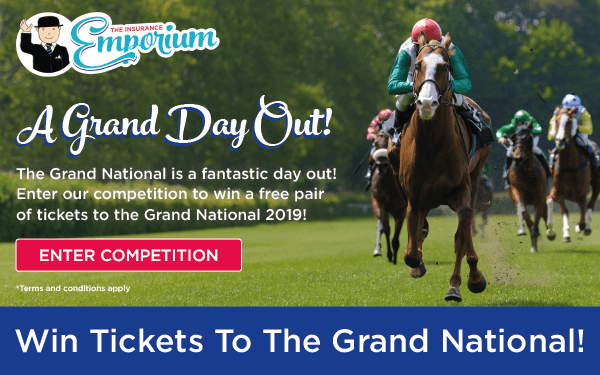 To enter, simply click on the link below and fill in your details for a chance to win two FREE tickets to the Grand National Festival Zone on Saturday 6th April! In the Festival Zone you’ll have access to facilities such as the Red Rum Garden, Wine and Champagne Terrace, as well as having great views of all the action! The Grand National has a long history. Its first running was way back in 1839, taking place at its home, Aintree, ever since, apart from during World War I, when it was moved to Gatwick Airport! Most people have heard of the main race – The Grand National; but it’s actually a three-day event, with over 20 different races taking place! It really is a grand day out, with people coming from all across the UK and beyond to witness this one-of-a-kind event! Whilst Aintree hasn’t got a formal dress code, visitors are encouraged to look smart, so it could be a great opportunity to really go all out and dress up to the nines! So why not enter our competition below and you could bag yourself two FREE tickets to the Grand National! If you have your own horse, whether you’re considering riding it to victory or going for some casual hacking, you might want to consider taking out horse insurance. The Insurance Emporium offer flexible Horse Insurance, and you could get up to 30% discount*. Trot yourself down to The Insurance Emporium to find out more! This blog is in no way sponsored, endorsed, administered by or associated with the Grand National.